A Galton board is a vertical board with N rows of pegs onto which a ball is dropped. Each time a ball hits a peg, it has a probability p of bouncing to the left and a probability of 1-p of bouncing to the right.The simulation's histogram shows the distribution of final x-coordinates as each ball leaves the board and is collected into bins. The simulation gives rise to the binomial distribution if the probabilities of left and right bounces are equal. At first there does not seem to be any pattern but after many trials the familiar "bell curve" shape begins to emerge. Run the simulation on "high speed" for a while to build the histogram and compare the fraction of balls that arrive at a given peg with the probability given by the Binomial distribution. 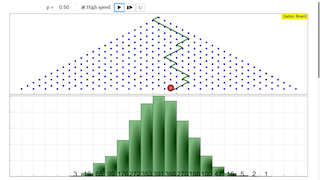 Compare the simulation to the Binomial distribution. The Galton Board Model was created by Wolfgang Christian using the Easy Java Simulations (EJS) version 4.1 authoring and modeling tool.The exercises were written by Anne Cox. This is a simulation of a Galton Board, a vertical board with n rows of pegs onto which a ball is dropped. Every time the ball hits a peg, it has a probability p of bouncing to the left, and a probability 1-p of bouncing to the right. Once at the bottom of the board, the balls are collected into bins, with the frequency of the balls entering each bin represented by a histogram. If p and 1-p are of equal values, then over repeated iterations of the Galton Board simulation, the binomial distribution should form.